KIM CHIZEVSKY WINS NUMBER FOUR!!! 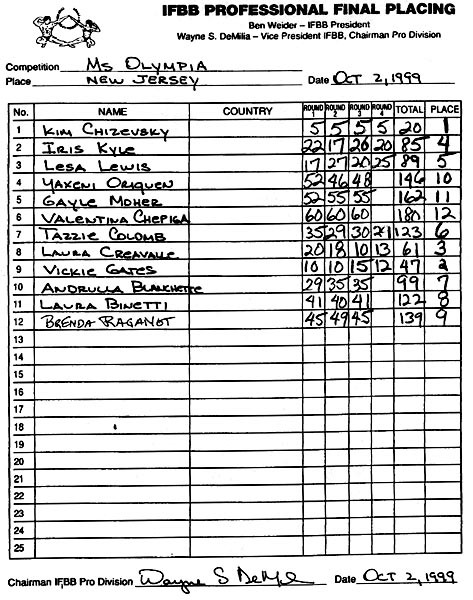 The 1999 IFBB Ms. Olympia competition was held before a near-sellout crown at the Meadowlands Crown Plaza Hotel in Secacucus, New Jersey on Saturday, October 2nd - along with the IFBB Women's Pro Extravaganza. The success of the show was a great relief to fans of professional women's bodybuilding after the near disaster when the contest, originally scheduled to be held in Santa Monica, California, was cancelled due to financial problems on the part of the promoter. Kim Chizevsky was the clearly convincing winner, appearing not only big, hard, and muscular but exhibiting an overall aesthetic quality she had never before achieved in competition. The judges gave Kim a unanimous first place in each of the four rounds. A more complete report, including photos, will be posted on the Webzine/Gallery shortly. Full coverage of the competition will be featured in an upcoming issue of Joe Weider's FLEX Magazine.